We designed and built a pair of these bedside tables for an elegant Palo Alto home. 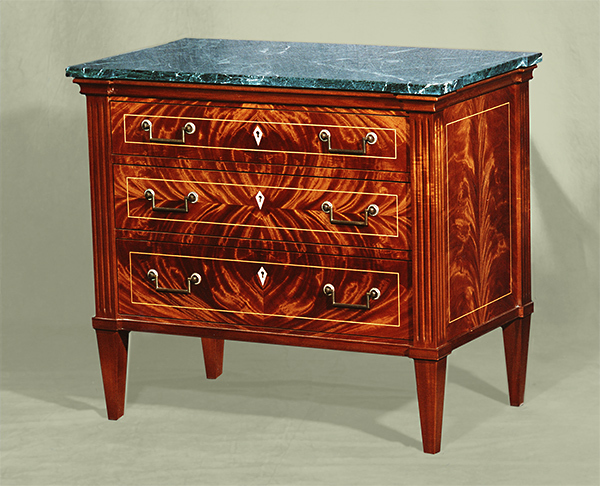 This fine furniture is handcrafted of Honduras Crotch Mahogany Veneer and solid Mahogany with Ivory inlays and Satinwood accent lines, the top is Verde Laurent Marble. The furniture was finished with a stain and lacquer finish hand polished and waxed.